The Nara is one of the most important schools ranked with the Yokoya in Japan's metal-carving world. Several schools were derived from this school. The primogenitor of the Nara family, Toshiteru's occupation was lacquering. He participated in building the Nikko Toshogu Shrine as a lacquerer. The second head Toshimune quit lacquering and started making metal fittings of kimono chests or folding screens. 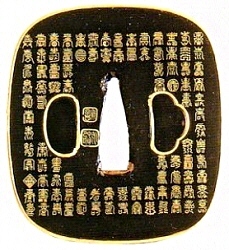 The third head Toshiharu started making sword fittings such as Tsuba or Kozuka. As the Nara family changed their job from lacquerer to sword fittings maker, they have nothing to do with other traditinal schools such as the Goto family or the Shoami school. The style of the Nara's pieces of works is different from others. For instance, the Goto schools seldom used iron plates as material, however, the Nara used iron the most. Or, the Goto chose only routine motifs such as lions or flowers & grass. On the contrary, the Nara picked up a variety of motifs, and expressed them in groundbreaking carving methods (like Katakiribori or Shishiaibori). Most famous three craftsmen from the Nara school. Namely, they are Nara Toshinaga, Sugiura Joi and Tsuchiya Yasuchika. His given name was Tahei. Pupil of the 3rd head of the Nara school "Toshiharu". 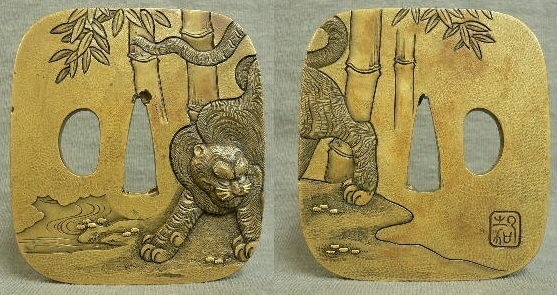 Toshinaga mainly produced Fuchi & Kashira and Kozuka. Not produced sword guards so many. He usually picked up figures, flowers & birds or animals as motifs of his pieces of works. He exceled at Iroe-Zogan inlaying on high-relief carved material. His given name was Tahichi. After manfood, Senuemon. Born in Kano of Mino Province as a son of Samurai of Toda Domain. After Toda Domain moved to Shinano Province under the order from the Tokugawa Shogunate, he became an official craftsman for the domain. He became a disciple of Nara Toshinaga in Edo. After shaving his head, he called himself "Joi". Joi liked to use Shibuichi (alloy of copper and silver). His pieces of works are elaborate. He was good at using "Narabori" carving method, and devised "Shishiaibori" carving method. His pen name is Issan-Do. So that he sometimes inscribed "Issan-Do Joi" on his works. His given name was Yagonin. Born in Tsurugaoka of Dewa Province (=Now Tsuruoka city of Yamagata Prefecture) as a son of Samurai of Shonai Domain. Studied metal-carving under Sato Yoshihisa. 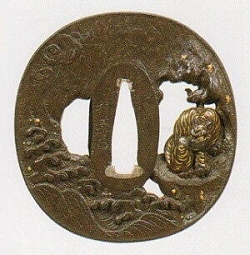 Later, he married with Yoshihisa's daughter, then, he threw away the Samurai rank and became a metal-carving craftsman. Though, at his age of 34, he left his wife and child with his father in law, and went to Edo. Became a disciple of Nara Tatsumasa. Finally, he went independent and opened a store at Kanda (The Tsuchiya school). Yasuchika adopted several metals, picked up a variety of compositions, produced a plenty of sword guards with Sukidashi and Takabori carving methods. His pieces of works are full of poetic sentiment and approachable. He called himself "Tou" in his final years.